Nothing embodies the Chesapeake Bay like the sight of a blue crab hanging off a fishing line or a plate of grilled oysters. These two animals have provided a way of life for Bay watermen for centuries and hold a central place in the culture and history of Maryland. 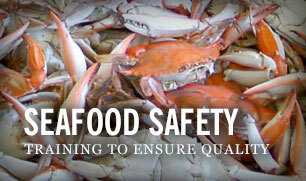 Both crabs and oysters, however, face an uncertain future on the Chesapeake. Blue crab populations have risen and plummeted several times during the history of the fishery. And because of past overfishing and disease, Bay oyster numbers now sit at a fraction of their historic volume. Maryland Sea Grant recognizes that conserving the Bay’s crabs and oysters, and the livelihood of Bay watermen, is important to the future of the state. To that end, we conduct science and outreach related to these iconic animals to ensure sustainable and profitable fisheries. Maryland Sea Grant Extension supports the work of Extension agents and specialists who provide a variety of technical assistance to support Maryland's developing oyster aquaculture industry and the restoration of wild oysters in the Bay, working in partnership with other Bay organizations. Our Extension staff members have worked to develop legislation to support this industry, to operate one of the largest oyster hatcheries, and to help dozens of Marylanders find funding and technical support to begin a career in oyster growing. Oysters and crabs may be the Chesapeake Bay’s most famous fauna. but the estuary is also home to a colorful diversity of animal life — including spawning fish, crawling turtles, and even stinging jellyfish. Like their more famous neighbors in the Chesapeake Bay ecosystem, these eclectic animals are crucial to its functioning. Each species plays a specific, and often complicated, role in the estuary.